Well, what do we say about 2015? Big goals, big changes brewing, big projects needing to get done. Man, we all worked long and hard this year. And, give or take a stumble or two, we snuck through it and did a reasonable job on 2015 objectives, in our humble opinion. Memories of the half dozen audits and the Christmas party are all a bit foggy, but we didn’t seem to be mentioned by name after any of them. Call that goal made. No felony convictions or lawsuits lost. That’s two. The stash of food additives and chemical compounds at home seem sufficient to help us deal with the onslaught of relatives over the next few weeks, so there’s reason for optimism on that front. Sure, we bought some December options on west Texas crude at $100 a barrel, but it was only with a third of the 401(k)—plenty of time to make that up, right? So, it seems we’re good with only one outstanding item—digest the 2015 GonzoBanker Awards! Once again, we put together our thoughts on the really good things we saw this year, the really bad, and the completely unexplainable. And there was no shortage of material on any of these fronts. For those of you who have not seen our awards before, a quick summary of the rigorous rules and methodology we use to compile them—uh, none. It’s hard for any banker to avoid gulping at the sheer long-term performance of George Gleason II and his team at the Bank of the Ozarks. It’s been almost 20 years since the IPO but this team keeps delivering growth and outstanding financial performance while keeping the values of the hometown bank that started it all. In the age of Twitter, Apple Pay and Lending Club, it’s important to remember the shareholder performance delivered by Gleason and team when compared to the behemoths. Bravo OZRK! Check out Gleason’s stock performance vs. Wells (WFC), Chase (JPM) and Bank of America (BAC) over the past five years. Not even close. Dan Schulman, CEO of PayPal. It’s nice to see somebody passionate about using new payments technology to make banking easier and cheaper for the financially disadvantaged. Dan’s Money 20/20 presentation on this was first rate. Jill Castilla, CEO of Citizens Bank of Edmond, Okla. This year, the award is less about advancing “your career” as it is about advancing “your bank.” No one has been more successful at using social media to generate awareness and a positive image for their bank than Jill (@JillCastilla, @CitizensEdmond). Bank Innovation named Jill one of the 10 most innovative CEOs in banking for 2015, and we doubt that Bank Innovation would know who Jill is if not for her presence on Twitter. Jill’s use of Twitter is a model for any bank CEO looking to engage on social media. To PNC, who at BAI Retail Delivery pointed to hiring a behavioral psychologist to review its origination process. Next up, ink blot tests in all employee recruiting and onboarding vendor RFPs? Seriously, given what we see in origination process reviews, we almost understand this. To those community bankers claiming their growing Compliance departments say no to everything. Did we hear a whaaaa? How about fighting harder with better examples and holding compliance officers as accountable as everybody else. Goes to “Virtual” or “Direct” banks. They’re baaaack. And with the same alter-ego strategy that made so much noise five to eight years ago. Let’s see if better technology and delivery tools get the idea farther down the road this time. BTW, it’s amazing how much an impending industry funding issue can get us focused again. Community bank marketing resources. With market opportunity heating up and big bank and big credit union competitors hitting hard, too many community banks lack marketing resources … or they have 2X more spending in sponsorships than the campaigns, analytics and digital sales improvements that actually bring in new business. Really? C’mon man! American West/Banner. Two very strong and focused community banks unite to combine big bank reach with community bank style and make the bet that it can scale to $15 billion and beyond. Our bet? We’ll give them points on this one. MB Financial acquires American Chartered. Mitch Feiger and crew have done an outstanding job rolling up some of Chicago’s best community banks into one $18 billion dominant local player. The MB team had their eyes on this prize for some time and they deserve credit for the major franchise they have created. It was fun to watch banks start to jigger their organizations with the new realities of the industry. A slew of new chief payments officers were appointed in 2015 to drive this critical revenue source. Chief digital officers were named to kick banks in the tail on growing business more through the digital channel, and chief data officers were appointed to begin using infinobytes of bank data more strategically. Driving real results instead of theoretical internal PowerPoint presentations will be a priority for all these newly promoted leaders. 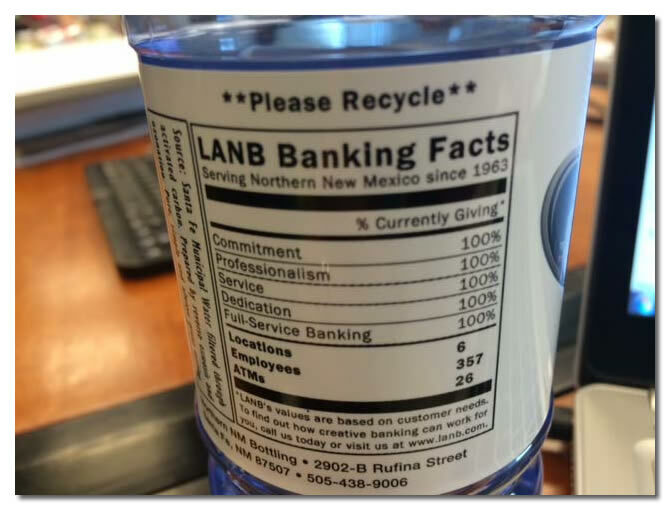 We don’t know what Los Alamos National Bank’s marketing department was drinking when it designed the customized water bottle labels, but we’re giving them big points for creativity. Bank project management offices. While there has never been a more well-intentioned and somewhat idealistic swarm of professionals, bank PMOs still suffer from being seen as a speed bump vs. a fast lane in bank transformation. Do we need governance, prioritization, business justifications and execution discipline? Absolutely! Are most banks achieving this today via their PMO? No way—not yet. Consumer Financial Protection Bureau for its “streamlined” new approach to the integrated TIL and RESPA. “TRID” is once again proof that bureaucracy takes on a life of its own while not really improving things. CFPB. The all-powerful banking regulator claimed that car dealers discriminated against minority borrowers—by guessing the race of borrowers based on last names and addresses in loan files, and claimed racism if the people they guessed were minorities seemed to be paying higher rates. It’s not like the CFPB didn’t know what it was doing was wrong. One internal memo acknowledges the weaknesses in the bureau’s methodology and admits to the litigation risks in its case against Ally. Q2 for the snagging of a marquis client in First Republic Bank. A phenomenally successful $50+ billion private/wealth management bank with a customer list to die for probably won’t hurt on the reference list. Bank: Washington Federal and Fiserv deserve major kudos for the conversion of this $15 billion bank with 250 branches onto the DNA core platform. A major move forward for Fiserv scaling DNA into banking and a major corporate transformation completed by Roy Whitehead and the WAFD team. Credit Union: Gulps may have occurred when $3 billion Desert Schools Federal Credit Union signed with recent new technology entrant Corelation, but this San Diego-based core provider and Phoenix area credit union made it happen. Great work on both sides of this high-stakes conversion effort. MCX. August 2012: Big merchants announce new consortium to combat interchange rates. October 2013: Walmart CEO Lee Scott is asked why, in the face of so many failed consortia before it, MCX would succeed. His response: “I don’t know that it will succeed, and I don’t care if it does, as long as Visa suffers.” July 2015: MCX announces its CurrentC mobile app is weeks away from launch. August 2015: MCX announces it may push launch back to 2016. December 2015: MCX members Walmart and Target announce plans to deploy their own mobile payment apps. No, MCX isn’t dead yet. Vendor management. “I love my core vendor because they have a fabulous SSAE 16 report,” said no CEO ever. If you’re spending several million dollars on technology and your efficiency ratio is stuck in the mid-60s, perhaps your vendor management program should include vendor cost and vendor performance reviews—as well as risk reviews. Just sayin’. FIS for its $9 billion acquisition of Sungard. The size vs. noise is worth noting. FIS (already not small by any measure) increased its revenue 40% over night while increasing its risk and trust solutions’ market presence at what appears to be a reasonable price. And yet, it was all fairly quiet. Pretty impressive. TEMENOS on the acquisition of Akcelerant. While the non-US core providers had continued difficulty making U.S. inroads, TEMENOS went where the growth is: strategic apps like loan origination and collections. Hats off to Jay Mossman and his team for building a heck of a story at Akcelerant. Now, where are all those U.S. T24 deployments? Yodlee for its breathtaking 7X revenue sale to Envestnet. One thing the Gonzo team gives Yodlee—this team got their fingers dirty with data and aggregation and APIs for 15 years. It will be interesting to see what comes next. While bankers largely tie loan growth to hiring energetic lenders, at least two tech companies are working to better engineer the loan marketing process. Commercial loan process provider Baker Hill announced a rebirth when it was acquired from parent company Experian by private investor group Riverside and merged with marketing analytics provider DMA. Let’s keep an eye on how this shapes up and competes with the nCino/Salesforce partnership, which is making a lot of noise out there. Meanwhile, Intuvo gained ground in credit unions with loan marketing engineering. Dave Brim from Fiserv DNA. Dave brings crowd-pleasing, almost scary enthusiasm and know-how to his technology and architecture sessions at demos without invoking a bunch of buzzword BS. Beyond that, Dave also avoids the common pitfalls of his technology presenter competition. He doesn’t endlessly talk about his own resume and brilliance, doesn’t try to avoid tough questions by implying the question is dumb, etc. He sticks to the point. Best of all, we’ve never heard him say, “Hey, our database is Oracle—so it can do anything!” Awesome job, Dave. Mobile Authentication. Biometrics is gaining traction as the method for mobile authentication. In October, USAA boasted that it’s reached 1 million mobile biometric users (authenticating via facial recognition, fingerprint, or voice with PIN still being an option, too). As biometrics evolve, it is expected that not one solution will win outright, but all forms of biometrics will aggregate to create a full view of the customer. The antiquated use of passwords, now considered by many a barrier to technology, could become a thing of the past. This is the FIDO Alliance’s objective as it strives to change the nature of online/mobile authentication. GonzoBanker introduces GonzoPay. We’re not at all blind to the fact that if you add “pay” to any product nowadays it makes you look cooler, makes it sound like you have hot new technology, and maybe, just maybe makes you worth more. And, to quote the late Jerry Garcia, we’ve been willing to sell out for a long time—there just weren’t any buyers. Since everybody has been announcing innovations with “Pay” at the end, we jumped on the bandwagon and nudged out TrumpPay, LamarOdomPay and Grumpy CatPay as this year’s biggest game changer. That demo and detailed product info? Just around the corner. Online Relationship Builder (ORB) from Alkami. You have to hand it to the folks in Plano. With a heavy focus on UI, digital marketing and customization, they added a string of large CU clients like Patelco and First Tech to a roster that already included the likes of Everbank and Idaho Central. Like all successful upstarts, the Big Mo celebration of new signings now comes with the big responsibility of solid implementations as resource demands grow. Blockchain, the technology behind Bitcoin, could provide a more secure and efficient way to transfer money and other financial assets in the future, and the financial services industry is listening. As of November 2015, there is over $1 billion in venture capital invested into Bitcoin/Blockchain firms, and big name firms exploring the possibilities of the technology include American Express, Bain Capital, Deloitte, Goldman Sachs, Deutsche Bank, Capital One, Citi, MasterCard, Visa, New York Life, NYSE, NASDAQ, Fiserv, DocuSign and Microsoft. Goes to the fast-moving Collison brothers, John and Patrick, for growing their startup Stripe over the past five years. These are not your dad’s ol’ mag strip guys. Their credo: “We think that building an Internet business is a problem rooted in code and design, not finance.” Can’t wait to see where Stripe’s API driven business takes the payments world. Remember the epic fail that was the Newton? Well Apple did it again with the Apple Watch. A few of us adopted the Apple Watch in hopes of keeping pace with current consumer trends the, promise of Apple Pay, and to answer our clients’ questions about the potential impact the watch could have on end-user digital banking expectations. The result? Turns out the Apple Watch is just an expensive watch with weak battery life that requires connectivity to the iPhone for its neatest features. We already had the device that was needed—the phone. The watch? Well, Josh Constine at Tech Crunch put it best with this review. Interactive Teller Machines. Man, there is certainly no shortage of investments in ITMs and the electronic branch. There is also no shortage of reasons being given to buy them. Lower branch costs … longer hours … attracting tech savvy customers … freeing branch people up to sell more … better service … it’s really R&D … my brother-in-law is the vendor sales rep … So we’re good with any of that, we guess. But in a time where organic deposit and loan growth is the elephant in the room and customers are running to non-branch channels like Usain Bolt at the London Olympics, is this the top ROI and strategic focus? Can we see an actual ROI? Just asking. Popular Community Bank in Miami. This bank has taken the IBS data warehouse tool and built a repository and data analysis capabilities that peers would envy. And the bank isn’t $50 billion and burning ungodly amounts of money to do it. Good evidence that we can make progress in this area. Goes to Barry Nelson, CEO of $2.5 billion Travis Credit Union, Vacaville, Calif. When it comes to core systems conversions, it’s common for most CEOs to say, “Get it done … and I’ll see you at the celebration party.” Not so for crazy Barry. This CEO knew the details and drove his team’s milestones hands-on to a near-flawless core conversion to Fiserv DNA. An old adage that never gets old: it matters when leadership hangs out in the foxhole. EMV hysteria. Despite the herculean efforts of panicky COOs across our industry, EMV transactions amounted to just 26% of all transactions payments processor TMG authorized over Black Friday and Cyber Monday. The reasons? According to CardFlight, only 42% of MasterCard and 52% of Visa cards are chip-enabled due to backlogged card producers and payment processors. That, coupled with snail-slow merchant adoption and the explosive growth of card not present purchases, means it will be a while before we see material fraud benefits from EMV. But hey, enjoy those four uncomfortable seconds for dip authorization. Both relative newcomers that are growing at “will the hotel be big enough” levels. Mom’s Donuts, in a strip mall right next to Junior’s Liquors off the freeway east of Los Angeles. Nice people over at Mom’s. U2 shares the stage with the Eagles of Death Metal to play a cover of Patti Smith’s “People Have the Power” in Paris three weeks after monsters staged their horrific attack at the Bataclan theatre. Peaceful and brave defiance—it’s what rock is all about. Sam Kilmer: Love Like Ghosts, Lord Huron. Go ahead and make that the whole album Strange Trails. Anyone remember albums? Ron Shevlin: Never Never Gonna Give You Up, Barry White. The “best song of 2015” doesn’t actually have to have first come out in 2015, does it? GonzoBanker wants to salute our readers who continue to make trouble in an industry that many predicted would be whittled down to a few mega players by now. It warms our Gonzo hearts to see entrepreneurial bankers building great companies and creating billions in shareholder value 15 years after we started sharing our observations through this newsletter. In 2015, our industry woke up to changes in payments, delivery, marketing and risk management that are more serious than the typical conference chatter. These trends will impact shareholder value in the years ahead, and the next few years will test which Gonzo troublemakers can best integrate digital, APIs, analytics and new revenue sources into their banks without wasting time and money on stupid fads. We look forward to calling out the true and the false, the good, the bad and the just plain ridiculous as 2016 unfolds. The team at GonzoBanker and our mothership, Cornerstone Advisors, wish you all safe and happy holidays. Calling all bank and credit union execs! Cornerstone Advisors’ Insights survey gathers bank and credit union executives’ views on key industry issues and identifies their priorities and concerns for the year ahead. Take the survey today and find out how your concerns compare with others in the industry. Credit union executives click here. Congrats on being the first to play the Steve Harvey card this awards season!